WHAT DOES A STINK BUG SMELL LIKE? CAN A STINK BUG DO DAMAGE? BEST STINK BUG SPRAY TO KEEP THEM OUT! WHAT IF YOU DON’T KNOW WHERE THE STINK BUGS ARE COMING FROM? 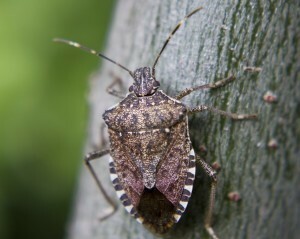 Stink bugs are active throughout all of the United States. Generally found in the garden, stink bugs will find their way into homes and structures when fall evenings start to turn cold. They acquired their name from a natural defense they have which is to release a smell that “stinks”. This smell enables them to avoid getting eaten by several species of birds and lizards. If you’ve handled a stink bug, you probably know the smell. It’s a pungent odor, strong and similar to cilantro, and used as a defense mechanism to stave off predators like birds and lizards. Stinkbugs have dorsal glands that can release this odor at will. On places where they roost and nest, the odor will manifest on surfaces, cracks and crevices. This odor will barely be detectable at first but to stinkbugs, it’s important and one of the main reasons they’ll return year after year and use the same structure over and over as a hibernation den. If your home starts to harbor hibernating stink bugs, its best you get rid of them before the infestation gets out of control. This article will help detail some basic biology about stinkbugs and then offer practical solutions you can apply to stop infestations before they get too bad. Stink bugs are in the family of insects known as pentatomidae. There are hundreds of subspecies located around the world and the United States has several which are active in and around the home. 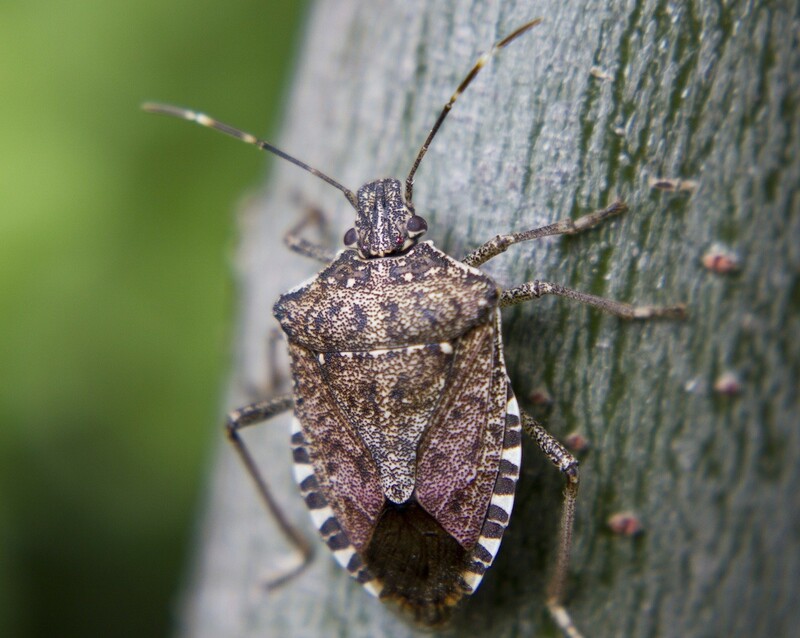 Generally thought of as an agricultural pest, stink bugs will readily take up residence around any garden or landscape rich with plants and flowers. Stink bugs have a “shield” shaped body which is very wide and measure about 1/2 inch long. The most common species range in color from green to brown. One species is a bright red and black. Here is a short video showing a brown marmorated stinkbug. Not only can a stink bug emit an odor which “stinks” but many people have an allergic reaction to this secretion so it is best to leave them alone. Stink bugs hibernate during cold winter months and will emerge in the spring as temperatures rise. Adults mate in the spring and females will lay eggs on plants. These eggs will be laid in groups and are not plant specific. Young will go through 5 stages to reach adulthood and this will occur in about three months. During this time they will feed on just about anything available. Plant juices like honeydew seem to be their choice of food but most will readily feed on tomatoes, beans, any type of fruit, corn, peppers or cabbage. Stink bugs have never been considered to be a destructive pest. However, if left unchecked, stinkbugs can cause significant damage to any garden. Most damage occurs to juicy vegetables and fruit once the protective skin is broken. Since young take about three months to mature, they’re generally old enough to mate in the beginning of summer and so another batch will emerge to reach adulthood before the end of the year. Stink bugs don’t like the heat and will migrate north out of the southern summers. But the longer growing season of the south enables them to reproduce better and longer during the year so the south harbors the highest populations. Stink bugs are hardy and will live a few years so adults which find themselves too far north will hibernate on buildings. This enables them to survive the harshest of winter and come spring, emerge to go about and forage for another summer. Southern populations may remain active all year if a mild winter keeps temperatures moderate. But even in the south, if it gets too cold they’ll migrate deep into any home and eventually end up inside living areas. Stink bugs may prey upon other insects and several species seem to be targets as long as they remain abundant. However, they will readily resort to plants, fruits and vegetables if no other food is around. Don’t be mislead into thinking any stink bug is a good bug. This type of thought has gotten many people in trouble. A few around the garden won’t do a lot of harm. However, if you have them eating the very produce you are trying to grow, the damage they do will quickly ruin your effort. Stink bugs are not efficient when they eat. They will generally move from fruit to fruit ruining several per day. They’re also attracted to light and will find their way into homes during the long summer nights when porch and deck lights are on and doors are being opened and closed. This summertime pattern will continue through the season until cooler nights and shorter days force the adults to seek harborage. Structures like homes are warm and provide adequate shelter from rain, cold and other elements so its only natural and to be expected for them to forage inside. If you have stink bugs active in your garden and you want to stop damage being done to garden fruit and vegetables, apply a product called VEGETABLES PLUS PERMETHRIN. This material is labeled for just about any pest and will readily kill off those living on the plants. It will also repel new ones and in turn, keep them away. This product is practically odorless and has a 1-2 week “days to harvest” so it will provide residual control too. Mix it at the rate of 2-4 oz per gallon of water and spray any plant, shrub or flower you want to protect. If you’re an organic gardener, use MULTI PURPOSE INSECT KILLER. It’s approved for organic gardening and like the Vegetables Plus, effective on stinkbugs. This product has just one day to harvest so it can be used safely right up to the day you plan on picking your crop. But it won’t last as long as the Vegetables Plus so expect to be spraying more if you go with this active. Mix 6.4 oz per gallon and apply it with any decent SPRAYER. You’ll need a good PUMP SPRAYER to treat. If you’ve had an ongoing problem for a few years and stink bugs are currently finding their way into your home, you’ll need to do some exterior treatments to stop the invasion. The extent to which you will have to treat will depend largely on how bad the infestation has become. The first phase of this program will be to get the exterior of the home treated in the fall, just before or as they start to congregate seeking relief from the upcoming winter. If you’ve had them invade in the past then you know as the nights cool, stink bugs will be found landing on your home and trying to find cracks and crevices in which to sleep during the night. In the early stages of this migration, they’ll be present one day and gone the next foraging for food. It’s during this time you’ll want to get the home sprayed with CYPERMETHRIN. Add 1 oz per gallon of water and expect to get up to 800 sq/ft of coverage per mixed gallon of spray. Cypermethrin is easy to use and will kill them quickly as well as keep them off your home. Cypermethrin should be mixed at 1 oz per gallon of water and can be applied with one of our SPRAYERS. Add 1 oz of SPREADER STICKER to the tank mix for maximum impact. 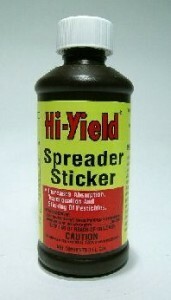 Spreader Sticker enables the Cypermethrin to “spread” over the bugs thoroughly so there is no chance of missing any. This will help get a quick kill since the stink bug has a protective skin which protects them well from insecticides. The trick for getting your home protected from invading stinkbugs is to spray as high as you can on the home letting it drip down the siding. This will get complete coverage. Most homes have just a few main entry points and these will be the key. Concentrate your efforts on these sites when spraying. Remember, most homes will require 2-3 gallons per application to get good coverage. And most will have at least 2 sides being used for main entry points. But don’t stop there. Treat as many sides as possible. Stink bugs will readily move to untreated sides so it’s smart to treat more of the home instead of leaving areas unprotected and vulnerable. In many cases the population hibernating is so large they’ll end up in living areas. If this is happening in your home, minimize their activity with an aerosol. We have several options that will work. The “fastest” acting and quickest killing is called D-FORCE. It comes with a crack and crevice straw which allows you to apply it deep into window frames, door frames, base moldings, around light fixtures and any other route of entry they might be using. D-Force will kill them quickly since it’s a contact killer but there are two drawbacks to this product. First, it has a slight odor. Second, it will appear “wet” when first applied so don’t over do it when spraying. But since results are immediate, you can reduce activity right away. So to start, treat rooms where you have activity and don’t be afraid to retreat once a week until no new ones are found. Expect to spray a few times in early winter – especially if you have an infestation which has been around more than one year. If you are consistently getting stink bugs appearing in certain rooms and don’t know where they’re coming from, treat with PT-PHANTOM. It uses a newer type active that doesn’t kill quickly. It’s slow acting and can take upwards of 3-4 days to kill anything which many people don’t like. But this is very much by design and a “good thing”. 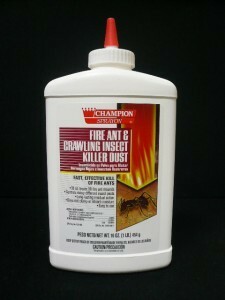 Since it’s slow acting, any insects which come in contact with it are then able to spread the product around. Certain insects (like stinkbugs) tend to group up when resting and hiding because they’re naturally a communal insect. This behavior is ideal for the active ingredient in Phantom. Basically it will be “shared” with all the members of any one community. That means even if just one gets some on it and then moves into an area where a bunch of stinkbugs are hiding, they will all be affected and die. This extra impact can be a big help in providing long term control – especially if you’re unsure where they’re nesting. Another benefit of the Phantom is that it won’t go on as “wet” as D-Force. For this reason (along with the low to no odor feature), you may want to consider the Phantom. Though the outside treatments with Cypermethrin and the inside treatments with D-Force or Phantom will certainly help to keep them off the home and out of living areas, this may not be enough to keep them away for good. Once homes get infested, they’ll be living and breeding deep inside attics, crawl spaces and wall voids. Stink bugs will naturally forage into these spaces and many are accessible from high points on the home. If you have reason to believe there are stink bugs living in your attic or crawl space, get them protected with DELTAMETHRIN DUST. This product is long lasting and ideal for large, wide open areas. It goes on dry and can be spread out easily for quick coverage and protection. Use 1 lb per 1000 sq/ft of area. Delta Dust is ideal for wall voids and attics when liquids can’t be used due to the absorbing nature of wood and insulation. Delta Dust will lay on top of everything in these areas so the pests can’t move about without succumbing to the treatment. For large open areas, apply the dust with a DUSTIN MIZER. This device can blow the dust over 20 feet out ensuring good coverage to remote areas where stink bugs will readily crawl and penetrate. Delta Dust will last 6-12 months per treatment too so you don’t have to use it nearly as often as the liquid or aerosol spray. And it works on many other pests so you’ll be protecting the home from a wide range of insects when applied. The other feature of Delta Dust is that it works in both dry and wet environments. This is important if the stink bugs are entering through dark and moist crawl spaces. Applications will last long even when wet which is needed to break the hibernating cycle of this pest. Since Delta Dust works so well you may decide to apply in rooms with stink bug activity. Out in the open, Delta Dust will leave a white residue. But this can washed away with a damp rag so no need to worry about making a mess; it easily cleans up. And using a dust behind light switch plate covers, electric switch covers and other spaces where you suspect stink bugs are entering is a great way to treat. Apply the dust with a HAND DUSTER which will allow you to “puff” the dust 2-3 feet deep into wall voids. These spots are commonly used for nesting and hibernating. Be sure to get around light fixtures and the covers for forced hot or cold air (not inside the ducts but around their outer shell). Another tool for use inside the home is our STINKBUG LIGHT TRAP. 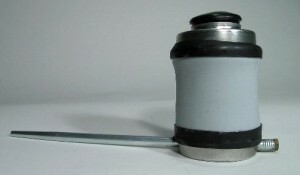 This trap uses a special design that “funnels” curious stinkbugs down to a holding tank which is designed to hold water and a little bit of liquid dish detergent. Once stink bugs enter and land in the water, they can’t escape. Stinkbugs, like Asian Ladybugs, are highly attracted to the UV light bulb in this trap and will fly around the top where the light emits. We also include a stinkbug pheromone lure to get them to enter. The trap works by getting bugs to fall inside as they attempt to land “in the light”. Basically they’ll be landing in the trap and falling inside to their watery grave. Set up one trap per room where you have ongoing activity. Its important to understand the trap works best at night, when other lights are turned off, so don’t expect it to attract or capture stink bugs during the middle of day when lights are on. In fact you may as well turn it off if the home is bright. But come the night it will work like a vacuum capturing any stink bug or ladybug foraging about. Lastly, if you have an ongoing stinkbug problem and plan on either painting or staining your home, be sure to add NBS PAINT/STAIN ADDITIVE to your paint or stain. 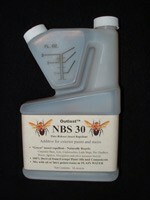 NBS is especially helpful when painting or staining wood that’s been used by stink bugs. NBS will last 1-2 years adding long term repellency to the exterior coating. Made from plant oils, this 100% natural product isn’t a pesticide and it won’t kill insects so you still need to treat as explained above to control current infestations. But stinkbugs don’t like NBS (neither do wasps, boxelder bugs, ladybugs and other invasive insects) so they’ll readily avoid siding, fencing, railing, decks, logs, overhangs, soffits and pretty much any location where NBS has been applied as a spray or when used in paint or stain. Stink bugs can be a fall and winter pest if left to live in the garden. If you have them active outside during the summer and want to keep them off your fruits and vegetables, use some of our Vegetables Plus for a quick kill and residual. Once fall arrives and they begin to move inside, keep them off the home by spraying with Cypermethrin. Once inside, you’ll have to use some D-Force Aerosol or Phantom to keep them under control. In some cases, dusting with Delta Dust will be needed for wall voids, crawl spaces or attics. Stink bugs are persistent and smelly so keeping them out of your house will require patience! Great article. Now I know what I am dealing with. I find about 1 or 2 stink bugs a day and I believe I have been bitten by them. I am very interested in getting rid of them. This is the first year I have ever seen them in my house. @Jan: No doubt you have what we call a “developing” problem. My guess is they’ve been migrating to your home the past few years and living in the shelter of the siding and wall spaces the structure provides. As our article above explains, eventually some will start foraging inside which sounds like is happening now based on what you’re seeing. What products to kill stinkbugs are safe to use around housepets (cats)? All of them. First, pets and for the most part, even people, won’t be coming in contact with any of the products when they’re applied properly for stinkbugs. As explained in the article, most of the applications are to be done outside on the home, in the attic and in wall voids. Now when treating living spaces, you should be treating cracks and crevices with the Dforce, Phantom or Topia aerosol. That means there will be nothing “out in the open” for people or pets to contact and therefore very little if any exposure to them. That being said, you do want to keep pets away when doing the treatments but once the areas are allowed to settle and dry at least 1 hour following the application, everyone and every pet can come back to these rooms without undue risk or exposure. To get more information on how to mix, store and use our products, just view our “safety videos” which cover most common questions and concerns. These video’s cover all practical things to do so you won’t be putting anyone at risk and still be able to treat thoroughly. Hi- We have been overrun with stinkbugs. We have 80-100 in each window and door of the house, sometimes twice a day. If you have a light on at night, to read in bed for example, they fly around the lamp. They drop into our hair all night and often crawl up our legs under the sheets. It is getting a bit tedious! I have tried many products inside and out without much luck. What would you recommend for a major treatment inside the house? Thanks in advance for any light you may be able to shed on this subject. For starters, I recommend you read the article above. It will explain everything you’ll need to know about stinkbugs including how you got them, how to treat and what products to use. As you’ll learn in the article, the real problem starts on the outside of the house and failure to treat outside when you first see them is in fact the reason you have so many inside now. This is why it’s so important to treat outside and not avoid the issue or else what you’re seeing is exactly what will happen. And now that you’ve got them inside the process will involve a lot more work (chemical cost, time, aggravation, smell, etc.) for you and the family but it can be handled if you use the professional grade products we’re recommending above. To see any of the products in the article, just click on them where they appear in “blue” and that will link you our product page which contains more information on the product including packaging and cost. The products you need right away is the Phantom Aerosol and the Stinkbug Light Trap. 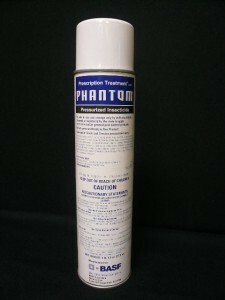 The Phantom is an odorless spray and though not fast acting on stinkbugs, it is long lasting. Phantom is ideal for use around windows because it goes on dry and won’t make a mess like most any aerosol or liquid spray. Lightly mist the surfaces where you’re seeing them active and within 2-3 days, any that go there will be dead. This will really help. Next set out at least one light trap per room which has activity. You really only need to run it at night when all other lights are off. During the day it won’t catch many with light all around it so use it in the dark only. And it’s important that all lights be off so you must make the room as dark as possible. This insures you’ll catch the very most stinkbugs. And it’s important to understand that traps by themselves won’t solve the problem but they can help big time. Lastly, as soon as you note activity on the outside of the home siding, treat it with the Cypermethrin listed above. This may not be needed for a few weeks but if you get the stinkbugs leaving your house this spring, you won’t have nearly as many returning next year. As explained, this pest lives many years and will return to the homes they use for winter hibernation until they die so once you get some, you’ll have them and their friends coming back year after year so the problem will no doubt get worse. And to stop this from happening, you’ll have to be spraying the outside with the Cypermethrin every spring and fall for at least 1-2 years now that the problem has gotten this bad. Good luck and if you have further questions, give us a call toll free at 1-800-877-7290 and we can further advise. My grandmother is coming home from the hospital soon and asked to put the screens in the windows (which haven’t been put in for about a year year and half). I have found two what look like to be nests in two separate windows/rooms (the side the screen doesn’t go in) second floor of the two story house. As soon as I open the window they start tumbling out so I slammed the window shut and locked. I don’t understand how they can all be living in there without food and in such a small space. What can I do? Where can I get these products that you talked about in the article? A good treatment with the Cypermethrin on the outside of the home is what you should do for now. This will no doubt get most of the stinkbugs you see nesting plus any that are in other nests you don’t know about. Because as many as you found, there is no doubt a lot you can’t see hiding behind shutters, around rain gutters, behind facia board and around most any window or door. From the inside of the house you can treat through the window by opening it just a little and spraying some Dforce. This will kill the ones in this space immediately and prevent them from coming back. I’d treat as many of your windows as possible. And since these are professional products with a very limited distribution, you can only get them by ordering on line. What do you recommend for outdoor control on structures in areas where cypermethrin cannot be purchased? Two good options are Permethrin (which is closely related to Cypermethrin) and Deltamethrin (also closely related). Use the Vegetables Plus if you need to treat plants, especially some kind of plant that will be yielding edible food crops. Use the Defense for structures and non fruit bearing trees and shrubs. What does the stink bug smell like? I’ve seen just a few on my blackberry bush this year and Id like to eliminate a problem before it begins. Stink bugs have a strong pungent odor similar to the herb cilantro used in salsa. I am painting the exterior or my cedar shingle house with your NBS Paint Additive mixed with Behr Ultra (water base paint) in a satin finish. The house will definitely take two coats of paint for good coverage. After painting the house I am also going to spray the painted surface with a combination of your Cypermethrin and your Spreader Sticker. #1) Should I mix the Cypermethrin/Spreader Sticker into both coats of paint or just the final coat? #2) How long should I wait after painting the house to spray with the Cypermethrin/Spreader Sticker? You have a great approach about to be implemented for the exterior of your home. No doubt the combination of the NBS and Cypermethrin will hold off Stink Bugs along with most any other pest that might consider using your home as “theirs”. 1) I wouldn’t add any Cypermethrin or Spreader Sticker to your paint. Instead, I’d only add NBS to the paint since it’s designed for this purpose (the Spreader Sticker and Cypermethrin is not). And I’d add some to every amount I applied to the home; not just the last coat. 2) Once the paint has been allowed to cure for at least 72 hours, the Cypermethrin and Spreader Sticker can be sprayed over the top. 3) Once mixed with water, you should be able to treat a good 500-1000 sq/ft of siding on the home. And with that kind of coverage, most homes will require 2-4 gallons of mixed material (not straight concentrate). So to answer your third question; it’s after being mixed. I had a huge stinkbug problem. They love crawling in the grooves of my old sliding storm windows (especially the ones that get the most sun) and nest all winter long. The room smelled so bad it was uninhabitable! I dislodged them one-by-one with a pencil and collected them in a zip-lock bag. Vacuuming just blew that horrible odor all over the room and made me vomit. Then I taped up the windows and left them that way for two years running. Now I treat the siding 2x / year with Cypermethrin + Sticker Spreader (just finished a treatment today). I still get the occasional stink bug in the house, but I initially had zillions. They are still able to get in and out of the attic despite me replacing the attic gable screen and spraying. I’m going to apply some deltamethrin dust. I think they are hiding in a wall void and/or in the insulation under the plywood floor. 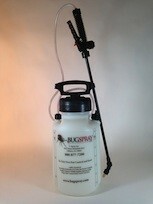 I forgot to mention – thank you to bugspray.com for the great products and information! I bought my house in March 2012. Stink bugs are all around the area of Culpeper county VA I live in so I found your website and used the info to help me combat them. I would normally see 3 or 4 stink bugs a day inside the house at various windows and other spots. I would always see some outside either on the exterior of the house or flying. My garage seemed to be the epicenter for them. I’d always see bunches of them every day there. I bought the Cypermethrin, Spreader Sticker and Daltrimethrin dust. Also bought the Dustin Mizer to spread the dust. I sprayed the outside of the house and garage initially twice and dusted my attic above the house, breezeway and garage with the Daltrimethrin. I also dusted anywhere in the house and garage that I don’t go into on a normal basis. I noticed immediately that the stink bugs were gone from inside the house. I also noticed dead ones everywhere in my garage. It doesn’t seem very difficult the way houses are designed for them to get into the attic so I’m sure most of them were getting in thru there. I highly recommend the spraying and dusting as it has reduced the stink bugs to a very tolerable level of almost none. Where I used to see approx 4 every day in my house I found 2 the other day for the first time since May and it’s now Oct. In the garage I’ll see a couple here and there but most of them are dead ones on the floor. I forgot to mention, not only did the chemicals kill stink bugs but every other bug in and around my house. The Cypermethrin lable says it kills many other types of bugs and it does. Besides the occasional stink bugs, my house was 99% bug free the entire summer. Thanks to bugspray.com for all the info and products. I’ve notice these bugs around in and outside my home lately. They make it in somewhere and I’ve used raid foggers inside and outside. They’re always around my windows, curtains, light areas and outside even on just my hanging plants or hiding on the back of patio furniture covers. I don’t plan on keeping the plants but what should I use to kill all of them inside and out? First, go with the Cypermethrin listed above in the article. Spray this on the exterior of your home. It will kill any stink bugs on the home as well as keep new ones away. And by doing this, you’ll really help minimize the chances of any getting inside. Second, don’t use any type of “total release aerosol” inside the home anymore. These products spew chemical all over everything and this is both wasteful and not needed. Treating your carpeting, furniture, etc. is simply not reaquired to control this pest because stink bugs won’t be interested in going to these areas. But what does make sense is to treat with the Phantom aerosol around the windows where they like to land and rest. Phantom is odorless and goes on dry making it ideally suited for treating these areas. We have a stink bug or two at least 4 times per week. The weather is cold so we have no idea where they are coming from. Our vents are in our ceiling but those are covered. We have baseboard heat. We very much want them out of our house but are looking for suggestions. Can you help. Thank you. As explained in our article above, stinkbugs will overwinter on manmade structures and houses are one of their favorite choices. For this reason it’s always best to treat the home’s exterior every fall. Usually just 1-2 exterior treatments will put in place a barrier that will keep them off the structure. And if they’re not able to lodge under the home’s siding, you won’t get any inside once the winter season arrives. Now obviously we’re past the fall season and in your case, well past the time that exterior treating will help. So what can you do now that they’ve found entry ways into your living spaces? Fortunately there are a few options that can help control the problem. The first and most direct approach would be to treat with Phantom or Dforce aerosol. Since you’re only seeing a few stinkbugs a week, I would say to use the Phantom. It’s odorless and can last 2-4 weeks per application. Dforce has an odor and will work quickly but this strength is only needed when dealing with large populations where a quick kill is desired. For light activity like you’re describing, there is no need for this feature so the odorless Phantom is the way to go. To treat, spray small amounts of Phantom into any crack or crevice you can find in rooms where stinkbugs have been active. No doubt at least one of these cracks is leading to a void or space where more stinkbugs are nesting and with any luck, some of the Phantom will reach any such nests which in turn will solve the problem. Common cracks that lead to nests can be found around window frames, ceiling molding, light fixtures, electric outlets, baseboard molding and air vents. And it’s most likely that there is only 1-2 rooms which are serving as the rooms of origin for the invasion so if you get these key areas treated, the problem should go away. The second option which will help is to install a Light Trap in any room where you’re finding stinkbugs active. These work at night and should only be turned on when it’s dark and no other lights are on. Stinkbugs will find the trap easily when all other lights are out and once they focus on landing on the light, they’ll get caught which will also help control any inside. Lastly, be sure to get some Cypermethrin to use in the spring and fall. This concentrate should be sprayed on the home where it will provide a barrier to the exterior of the home. This barrier will both kill and repel invading stinkbugs and must be done if you won’t want to see any next winter. Simply spraying down the siding using a standard Pump Sprayer will really help and should be done in the spring as well. This way you’ll get any that are leaving your home. These are important because stinkbugs live several years and will return to homes they’ve used in the past. And when they come back, they tend to bring their friends so it’s best to get them as they’re leaving for the summer so there is no chance of them coming back next fall. Next, be sure to spray again next September-October so new stinkbugs won’t find your home attractive for overwintering. This type of preventive maintenance will go a long way at keeping them off the home which ultimately means you won’t be seeing any inside come next winter. I’ve found a few dead bugs on the floor near a window which is by a vent. I’ve also found a dead one in a bathroom ceiling light. This past summer is the first time I have ever seen them near the house. I’m afraid they may be in the duct work or the attic. What is the best way to find them in the winter in the attic? Are they visible just laying around waiting for the warmer weather to come back? As our article above explains, they don’t die from year to year but instead look for structures on which to over winter. So on a home, if they are nestled mostly up under the home’s siding, they would most likely go dormant until the spring and at that time, they’d emerge and leave. In that scenario, the homeowner would never know they were ever around. But in most cases they’ll forage deeper and deeper into home seeking the warmth. This foraging will ultimately lead to some coming out in the living space during the winter which is no doubt what you’re experiencing now. So to answer your questions; if they are nestled in a void where they can forage out to the living areas of your home, they’ll do this as soon as the opportunity is presented. This means there won’t be any hiding in those spaces for long because if they are there, they’ll just want to come into the heated home. Now if you get into the habit of spraying the outside of your home with some Cypermethrin, chances are high you’ll be able to kill off any that leave your home this spring and then next fall, any that return will either be repelled or killed from the treatment. This approach should pretty much take care of any developing problem and make it go away for good. As for the problem you’re experiencing right now? No doubt treating the cracks and voids around your windows, baseboard molding, door frames, etc. with some Phantom Aerosol would be suggested. This way any more that might be living in these spaces or attempting to move through the area will pick up some of the treatment and die. Now do you need to treat your attic as explained above? Probably not. Areas like wall voids and attics do sometimes need to be dusted but this is usually suggested when homes are severely infested. And in the end, a few crack and crevice treatments done over the next 1-2 months should control any trying to get inside the home. Next, treating the exterior of the structure this spring and fall will keep new ones from coming around. Ultimately, this should be the best way to proceed if you want to get your home stink bug free. Good luck! I live in a new custom home which is built extremely tight. We have cement board siding with every joint caulked and spray-in foam around all windows, doors and penetrations. We now keep our windows and doors closed almost all year round; not by choice but because of stink bugs the last 2 years. We live in a rural area with farm fields on two sides of our property. The stinks bugs are not bad during the heat of summer but come fall when the corn is harvested it is like a Stephen King movie. It is now February 1st and we still have stink bugs in the house everyday. Sometimes only 10 on a cool and cloudy day but when the sun is out and the house is warm it may be 50 or 100. They have been primarily on the large wall of windows in our living room, which has a southern exposure for the last 2 years. However, the last few weeks I am now finding them in the kitchen which is on the north side of the house and on the floors throughout the house. I use an old kitchen dish brush to knock them into a and plastic container of soapy water and then flush them down the toilet, which works well, but these bugs are driving me crazy. Next year I will definitely try the spray on the exterior of my home, but do you have any idea how to battle them now. Thank you. First, it’s important to understand that no structure can seal out insects. In fact houses are designed to “breath”. And this breathing is crucial to owning and maintaining a healthy, happy structure so it’s normal and very much needed for any building. So with that being said, I’m sure all the “extremely tight” caulking and foam you mention is doing it’s job by keeping out the cold and water. But by no means should this be mistaken as some kind of pest control because the two are not related. True, a “tight” structure can help prevent certain kinds of insect activity. But tight structures are also more likely to attract anything that overwinters or hibernates from year to year. This is because such insects need tight spaces to help keep them warm and in close proximity of others similar in kind. And (not surprisingly) one of the more common insects that loves tight buildings are stink bugs! So at this point it’s safe to say you have an active population nesting on your structure. And if you read our article above, you’ll learn that this populous will only grow and grow from year to year since stink bugs will be marking your home as a good place to over winter and their markings in turn will attract more stink bugs. And once they get onto the home to nest, they’ll spend the winter attempting to get closer and closer to the inside warmth which ultimately will lead to some inside. Now based on the numbers you’re seeing, you no doubt need to treat. And as explained above, you should start spraying the outside of the home as soon as the weather warms and you see activity on the outside of the structure. In other words, do not wait till next fall to treat. By treating this spring, you can no doubt dramatically reduce the population that’s already using your home and this can really help reduce the amount that return in the fall. Use the Cypermethrin listed above for the exterior treatment and be sure to treat as much of the siding where you see them active. This way you’ll be killing them before they leave for the summer which means they won’t be able to return next fall. There are also two things you can do right away to help deal with the current problem. The first is to treat all the cracks and crevices of every room where they’re active. Use Phantom aerosol for this treatment. This product is easy to use, odorless and highly effective on stink bugs. By treating baseboards, window frames, door frames, around ceiling molding, light fixtures, etc., you will be putting in place a barrier that will kill any that are being drawn to the inside warmth of your home. And if you by chance treat the main entry way, you will be able to dramatically reduce if not eliminate any inside activity within a week or two. The second defensive device you can employ is a Lighted Stink Bug Trap. These should be turned on at night, just before you retire for the evening, and kept in any room where activity is seen. It’s important to have as little light as possible in the room so the light trap will become easy to see for the stink bugs. If deployed in a totally dark room, these traps will catch any stink bugs active and this will prove to be a lot easier and a more effective way to control the problem for now. In summary, you should treat right away with some Phantom. This will do the most for the active problem right away. And setting out a light trap will no doubt help too. 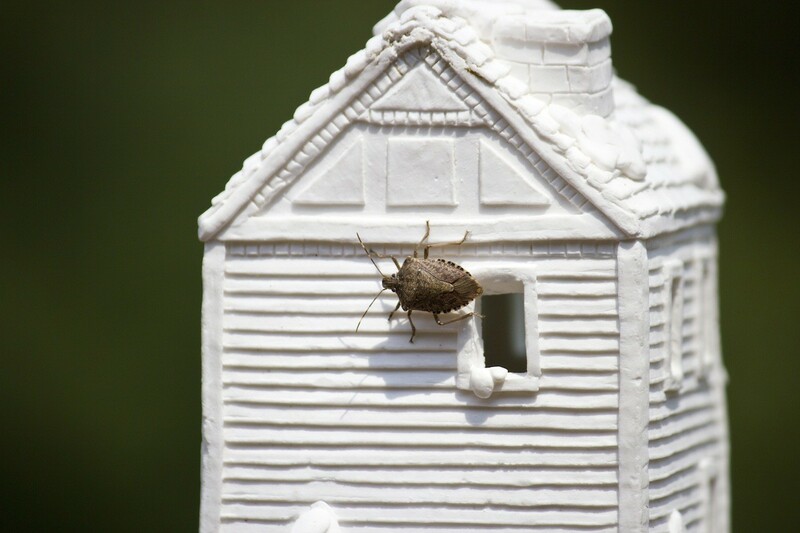 Lastly, treat the exterior of the home this spring and then again next fall to put in place a barrier so foraging stink bugs won’t be able to land on your home and live. Ultimately this will get rid of the problem for good. Good luck! Thank you very much for your guidance, much appreciated !!! We are planning on staining our log home but we have a terrible problem with stink bugs. What can be done to try and get rid of these nasty critters? The first thing you should do is read our article above which will tell you all you need to know about this pest including treatment options. In the article you’ll learn about using a paint/stain additive called NBS whenever you repaint or stain so now would be a great time to get this applied. Next, once the stain has dried, if you start noticing stink bugs still active this spring, start spraying with the Cypermethrin immediately. This will be needed to kill the ones leaving your home so they don’t return next fall. Since the NBS won’t kill them, you’ll need Cypermethrin applied now. Next, wait and see what happens next fall. My guess is you’ll have to spray with Cypermethrin but if your problem is mild to not quite “medium bad”, the NBS might keep them off the home for the rest of this year. But if they do come back this fall, spray the Cypermethrin to keep them off the home. This should keep them from nesting again. And if any show up inside, start using some of the aerosol’s we have listed above to kill them during the fall/winter months. I’m also having this issue. I’ve never had this issue before, I’m finding stinkbugs in my room and my assumption is there is a nest near my window. I do not understand how these bugs are ending up in my room due to the fact my window is never open. I’m almost scared to sleep at night. Any suggestions to get rid of my issue? I found 5 stinkbugs in the past 3 weeks. For starters, I suggest you read our article above. It will help explain why you’re seeing them inside. As you’ll learn, stink bugs will initially come to your home and use the outside for shelter siding for protection during the cold months of the year. Once they get up under the siding, into soffits and around window frames, it usually means they’ll start to show up inside within 1-2 years. At this time I suspect this is happening on your home. So in fact there is no “nest” to speak of but rather a group of stink bugs that are hibernating (to keep warm) close to your window. And since they naturally seek warm air, if you allow them to live on the exterior of the home, inevitably some will be seen inside as they move toward the warmest part of your house. So if you want them gone from inside, you’ll need to start spraying all cracks and crevices with Dforce or Phantom aerosol. Either product will provide immediate control of stink bugs; the Dforce is quicker acting but has an odor. Phantom will take a day or two for the stink bugs to die but it’s odorless and goes on dry making it the best choice for inside treatments. Now if you want them off your home altogether so you never see any inside the house, you’ll need to start getting them where they’re roosting. This means treating the homes exterior. And the spring is a great time to spray so you can “intercept” and kill the stink bugs currently using your home now. This way they don’t return next fall which they’ll surely do if you don’t get them before they leave. You see, stink bugs leave scent trails on homes they use so once your house is marked, they’ll be back next fall and when they return, they typically bring a lot of their friends which is why the problem will get worse and worse if left untreated. 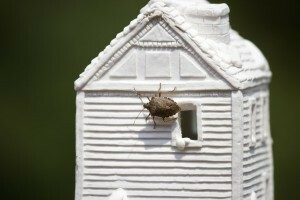 Most homes that have stink bugs will require at least one treatment in the spring and one in the fall. Bad infestations will require more treatments each of these seasons. But in the end, getting them on the outside of the structure is the way to knock them out so none are seen inside and really is the best way to proceed for long term control. I am currently staying in a motor home in a campground in south central PA and the stink bugs are horrible. I can’t pinpoint how they are getting in, but I suspect they may be finding their way in around the seals of the bump outs or up top around the vent ducts. I want to treat inside and out using the products you mentioned in your article. Is the Cypermethrin with the Spreader Sticker safe to use for treating motor homes? Thank you. Absolutely. But you need to do more. As you already figured out, it’s tough to isolate stinkbug entry points so the best approach is to treat as manny cracks and crevices as possible using Phantom aerosol. Because of how Phantom works, you’ll be able to affect any nests that are hiding out of sight. And with Phantom being odorless, you can use it both inside and outside. Now once you’ve successfully treated with the Phantom, you should then spray the exterior of the home the Cypermethrin and Spreader Sticker. This will get any coming and going the Phantom treatment misses. Lastly, be sure to spray with the Cypermethrin every fall and spring at least once to insure they don’t re-infest the motor home. Hello. I am having a bit of a problem with stink bugs. We got this house about 2 years ago. Its weird because we didn’t have them last year. Anyway they are bad on the second floor. They are trying they’re hardest to get in and some were around my ac but I duct taped all around it. I can’t stand the site of them though there is at least 10 at my window at all times and it gives me the creeps and I’m constantly checking to see if any got in and I’m driving my husband nuts (lol). I want to try Cypermethrin. How much do I need to buy? I think my house is around 2200-2400 sq ft. Its a decent size house. No doubt a good spraying with the Cypermethrin will both kill what you see active now as well as stop new ones from coming around. And since the concentrate will store for 4-5 years no problem, getting some extra would be fine to do since its cheaper in larger sizes. Now based on the size of the home, you’ll need to apply 2-3 gallons per treatment if you want to cover most sides of the home. This would be the smart thing to do as well for at least 1-2 treatments to insure you don’t just move them around the home. So based on that consumption rate, the 8 oz would be the smallest size to get but the 16 oz would be the smarter buy. I think most of my questions have been answered by reading the article and other peoples questions but I have just a couple more. We didn’t notice the stink bugs until winter was already here and there are only a few here and there. The majority we have seen are in our finished attic where our sons sleep. The only part of the attic room that is not finished is the portion of the wall that slants and has a crawl space behind it. There is a very small door that you can use to get into the crawl space from the room. I am thinking we need to spray this area but wasn’t sure what was safest and best to use since it is connected to and accessible from our sons room. It is a fairly large crawl space. We hope to finish it off at some point to make it a small hideout for our kids so I want to use something that won’t affect us being able to do that. The only other place we have seem them is in the kitchen so I don’t know what is safest to spray there and if I should spray the whole kitchen or just the windows. We will treat the outside once the weather is appropriate. Will the stink bugs build nests indoors? Is there something specific I should look for as far as nests? Where would they build it? I have no idea where they are getting in. Not a clue! Any help would be appreciated! You are right in thinking that no outside spray should be applied now. In fact the ones that found your home this past fall are now deep inside wall voids, attic spaces, etc. and outside spray won’t affect them. That being said, you should be prepared to spray as soon as the outside temps warm. This is usually March-April. The goal of these spring treatments is to kill any that are using your home so they can’t return next fall. You see, stink bugs will live several years and once they find a suitable home on which to roost, they’ll keep coming back to the home year after year. And when they return, they always bring friends. This is why the problem gets worse and worse so by spraying the home in the spring when they’re leaving, you’re taking a proactive stance that can put an end to the problem once and for all. As for inside nests? They don’t build nests. But they do huddle in groups so its common to find 5-10 together in a clump. This is done for many reasons but is also something that can be exploited. More on that shortly.. There is nothing “specific” you should be looking for other than areas where they’ll want to roost. This will be around any window that opens, door frames, outside shutters, around patio lights, attic spaces, ceiling lights, and other warm locations or where there is day light entering the home. Which leads us to what you can do now.. So if you read our article above, you should have a clue but here’s a brief explanation. Since stink bugs like to huddle in groups, you can exploit this behavior by applying Phantom aerosol to where you see them most active. Phantom is odorless and goes on dry so it’s ideal for use inside homes. Apply it around windows, doors and light fixtures by lightly misting these surfaces. It can safely be used where people are active so using it in your kitchen is fine. Just follow the safety guidelines video we have on the Phantom product page and you’ll be able to safely apply it and not have any hazard associated with it’s use when the application is done properly. Now if just one stink bug walks over a treated surface, it will pick up some of the Phantom (which is not detectable by insects) and then when this stinkbug returns to it’s group, it will contaminate the others. This is one of the reasons why Phantom is such a great product to use for stink bugs. Next, set out some Light Traps. I would say one in your sons room and one in the kitchen would be prime locations. Turn these on late at night, when all the lights are out, and you’ll get the best possible results. Running them during the day is usually not productive so there is no need to keep them on 24/7. Lastly, be sure to spray the outside of the home this spring and then again next fall, before they return, and you should be able to enjoy a stink bug free winter next year. It could be their “stink” which is left to mark good locations for nesting and breeding. But in general, this excretion is clear and not so noticeable. So if I was to guess, I’d say its more likely their droppings. In some cases, the color of their droppings can be dependent on what they’re eating so if they have access to something that color for food, their droppings would match.